When I travel to Italy, gelato is on my mind 24/7. I have been known to eat it three or four times a day. 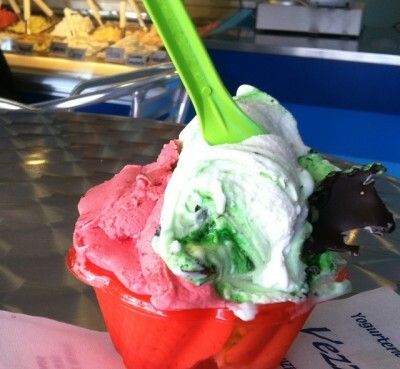 Mi piace gelato molto!—I like gelato a lot! However, my gluttonous affection for frozen dairy desserts did not begin with my first step inside of an Italian gelatoria—gelato shop. Ice cream was a rare treat for me growing up. With four kids in the house, and a tight budget, ice cream was not a stock item in our freezer. When my mother did happen to splurge and bring home a half-gallon, there was an almost “every man for himself” frenzy once we were given permission to open the container—which didn’t last a day between us kids and our parents. Sharing was a virtue that did not come easily to us kids; consequently it was no treat when my mother was forced to become the “Portion Police.” Sometimes I think she steered clear of the ice cream aisle, even when the budget allowed, just to avoid the aggravation of having to listen to us fight over it. “I scream. You scream. We all scream for ice cream!” was more literal truth than cutesy slogan in our house. On some primal level, I still have that ice cream frenzy, even though I can purchase and eat as much as I want now. It’s probably why I get so excited about gelato in Italy, since there seems to be a gelatoria on every corner. Plus, the Italians have a very diverse and eclectic range of flavors. Every shop seems to offer 30+ flavors, ranging from berries to creams to chocolates to nuts to melons to spices (like cinnamon) to herbs (like lavender, sage, or basil), and the list goes on. Ice cream and gelato are not the same thing. Gelato uses milk as its primary base ingredient, thus lowering its fat content, while ice cream uses cream—hence the name, and its fat content! And the differences don’t stop there. Ice cream uses eggs and sugar for a richer custard-style dessert that is churned at a higher speed to whip air into the mixture as it freezes. Gelato typically doesn’t use eggs and uses less sugar, relying on a wide range of flavorings to satiate your taste buds. Its richer and denser consistency is achieved by churning at a slower speed, reducing the amount of air. We never ate ice cream in the winter—winter in northern Illinois was cold enough outside without also eating something frozen inside. Ice cream is really a summer-only dessert for me. 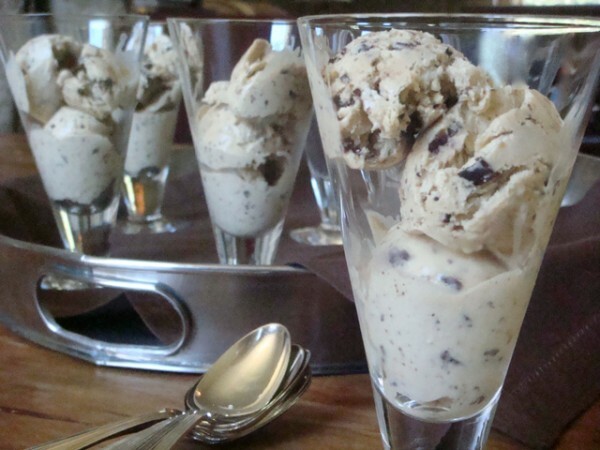 Which is why, as part of my Chianti at Home blog posts for DaVinci Wine, I thought I’d do an American ice cream (a custard base) recipe influenced by a popular Italian gelato flavor—vino—in July. 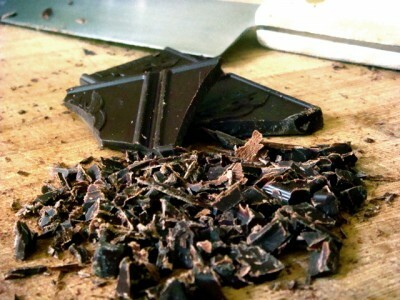 I add bittersweet chocolate “chips” to round out and complement DaVinci Chianti’s dark, red fruit flavor tones. Get more flavor into your desserts by using bittersweet, instead of semisweet or milk chocolate. Bittersweet often has the percentage of the cacao bean (cocoa bean) used listed on the outside of the package. The lower the percentage, the lower the “bitterness.” Most bittersweet or dark chocolate recipes typically use “60% cacao.” However, if you really want to be bold, use 70–72% cacao to capture the smoky and earthy nature of bittersweet chocolate—a perfect pairing with ripe fruit or with red wine like DaVinci’s Chianti. When DaVinci Wine sent me to Italy as part of their 2012 DaVinci Storyteller Experience, I knew I was going to gain a clearer understanding of the wine making process. But what I hope to impart to you now is my deeper appreciation of wine, not only as an adult beverage, but also as a complexly flavored food—which is how Italians think of wine. It is a drinkable “food.” Its use as a food ingredient is only limited by your imagination. A young wine, like DaVinci’s Chianti, should be consumed while it is young—meaning within the first year or two after its vintage date. Young wines are “designed” to have a more fresh, bright, fruity, and straightforward taste. They are not wines to be collected to see how well they will age in the bottle. 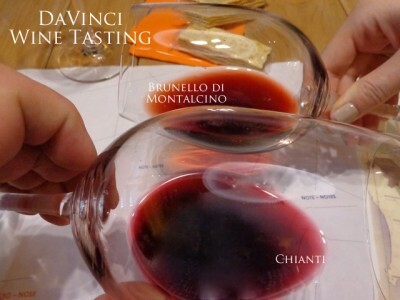 Chianti Riserva is designed a little more along the line of “maturing” wines, while DaVinci’s Brunello di Montalcino is definitely to be consumed when mature. A young red wine, like DaVinci’s Chianti, will have a deep ruby color, while the more mature Brunello di Montalcino will have a lighter, mellowed orange or rust-colored hue. The opposite is true for a white wine. DaVinci’s Pinot Grigio, a young white wine, is pale yellow, while a more mature white wine has a dark golden color. When using DaVinci’s Chianti in a recipe, I consider the notes of ripe red fruits (like cherry, plum, and strawberry), the bright tone of its young wine flavor (meaning the flavor is a bit assertive or up front), and its ruby color. These were also considerations for my previous DaVinci Chianti at Home post recipes —Skillet Chianti Fajitas and Zesty Chianti Barbecue Chicken. What recipes do these “notes” inspire you to compose? 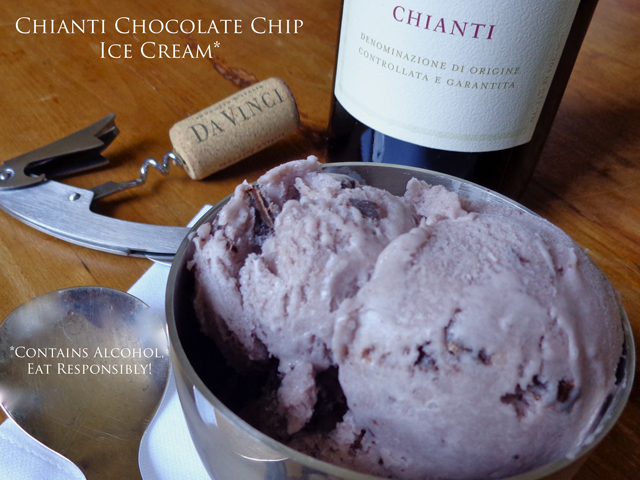 Sitting on a pier at the lake, around an evening campfire, or relaxing after an al fresco dinner party on the patio with friends, Chianti and ice cream are a perfect pairing—made even better when the Chianti is already in the ice cream. 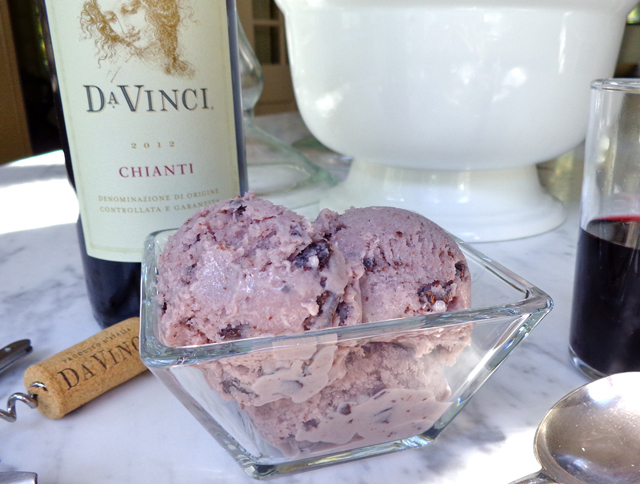 “Mi piace ice cream di chianti molto!” may become my new summer credo. I hope it will be yours too. Buon Appetito ~ and eat responsibly! *Hurry, you still have time to vote for DaVinci Wine’s 2014 Storytellers. Choose your favorite for DaVinci to send to Vinci, Italy, to share their creativity while exploring the wine, vineyards, and the Tuscan countryside alongside the Cantine’s welcoming staff—VOTE NOW! 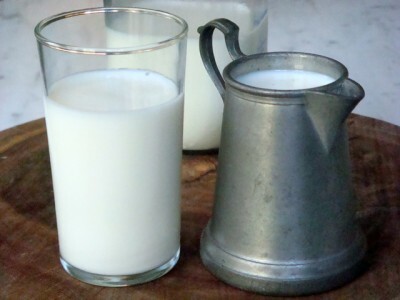 In a medium heavy-bottom saucepan over medium-low heat, combine the cream and milk. Cook, stirring occasionally, to prevent a skin from forming, and bring to a simmer—until tiny bubbles form around the edge (the correct temperature is 170 degrees F), about 9 to 12 minutes. Meanwhile in a medium glass or metal bowl, whisk the egg yolks until smooth. Gradually whisk in the sugar until it is well blended and the mixture is thick and pale yellow. Next, temper the egg yolks by very slowly adding in the hot milk mixture while whisking constantly—if you add in too much too quickly, the eggs will scramble. Return the mixture to the saucepan and place over medium-low heat. Cook, stirring constantly with a wooden spoon, until the custard is thick and leaves a path when a finger is dragged across the backside, about 5 to 8 minutes (the correct temperature is 180 to 185 degrees F). Do not allow to boil, otherwise the custard will curdle or separate. Pour the custard through a fine- or medium-mesh strainer into a clean bowl. Let stand to cool until room temperature, stirring about every 5 minutes. [To cool quicker, halfway fill a large bowl with ice and water, and place the bowl with the custard into this ice bath, stirring the custard until it is cooled.] Once fully cooled, cover and refrigerate until very cold, at least 3 hours or up to 24 hours. Place the measured Chianti into an airtight container and refrigerate, like the custard, until very cold, at least 3 hours or up to 24 hours. Makes 1 quart (8 servings). FYI~ Chilling the custard mixture and the wine before combining and churning does two things. First, putting chilled base in the ice cream maker means that the machine does not have to work as hard to freeze the custard as it churns. Secondly, the warmer the base, the more likely it is to freeze water crystals trapped in the custard, which will result in a “grainy” or “icy” consistency. So for the best results—chill before you churn! In Italy, there are some unspoken “rules” when ordering. First, you choose the size of the cup or cone you’d like. Second, you choose your flavor combination—regardless of size, you get to order 2 gusti—tastes of gelato: 1 scoop of each flavor. Try ordering just one gusto and watch everyone around you, and behind the counter, insist that you order a second flavor; even getting 2 scoops of just one flavor seems like an insult to the gelato itself! Pictured here is a 2.5 euro cup (price identifies the size of the cup) with a gusto of raspberry–lampone–and a gusto of mint chocolate–mente cioccolato. 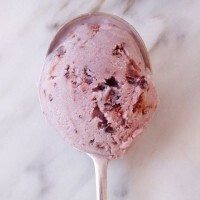 You may find my no-cook “Mascarpone, Chocolate, and Raspberry Gelato” recipe on the Beyond the Pasta app.